N Branza-Nichita, et al（1999）「Tyrosinase folding and copper loading in vivo: a crucial role for calnexin and alpha-glucosidase II.」Biochemical and Biophysical Research Communications(261)(3),720-725. K Jimbow, et al（2000）「Assembly, target-signaling and intracellular transport of tyrosinase gene family proteins in the initial stage of melanosome biogenesis.」Pigment Cell & Melanoma Research(13)(4),222-229. K Toyofuku, et al（2001）「The molecular basis of oculocutaneous albinism type 1 (OCA1): sorting failure and degradation of mutant tyrosinases results in a lack of pigmentation.」Biochem Journal(355)(Pt2),259–269. 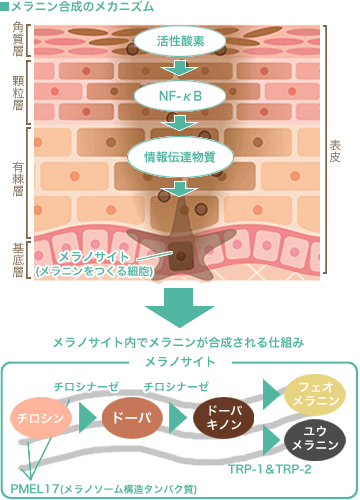 K Nakamura, et al（2003）「Down-regulation of melanin synthesis by a biphenyl derivative and its mechanism.」Pigment Cell & Melanoma Research(16)(5),494-500.